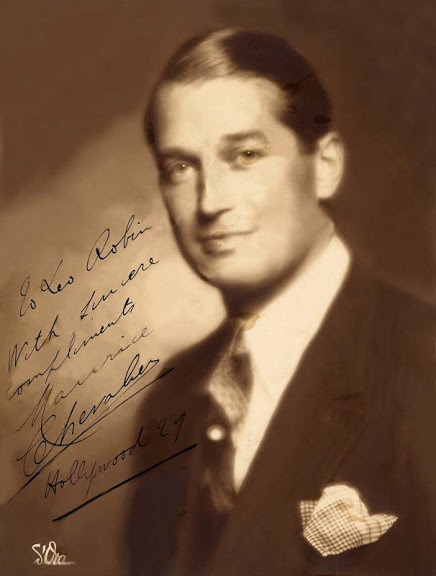 A very young Maurice Chevalier presented Leo with this personally-inscribed photo in 1929 as an expression of his affection and gratitude. 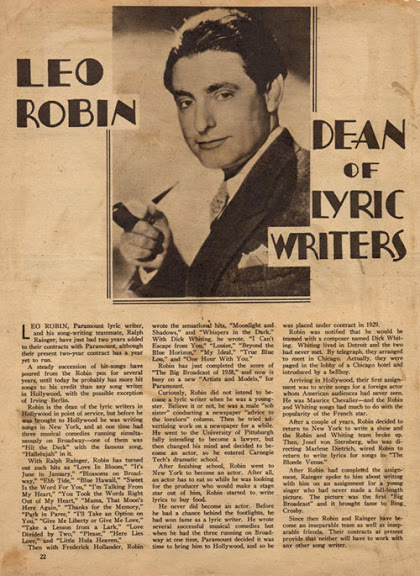 Leo gave him the words that he is universally known for: "Every little breeze seems to whisper Louise." 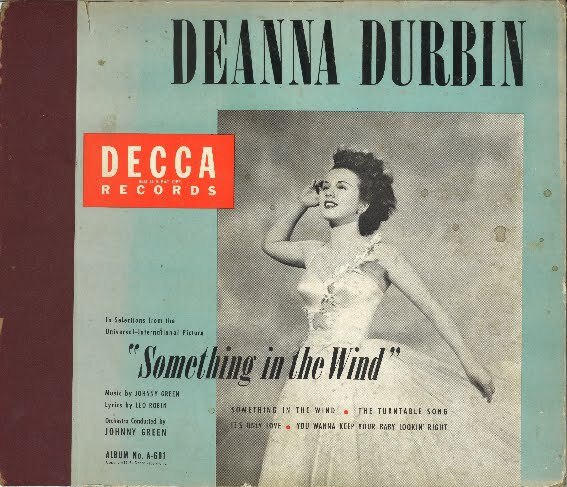 Decca Records’ cover of the 78" album for Johnny Green’s Something in the Wind. 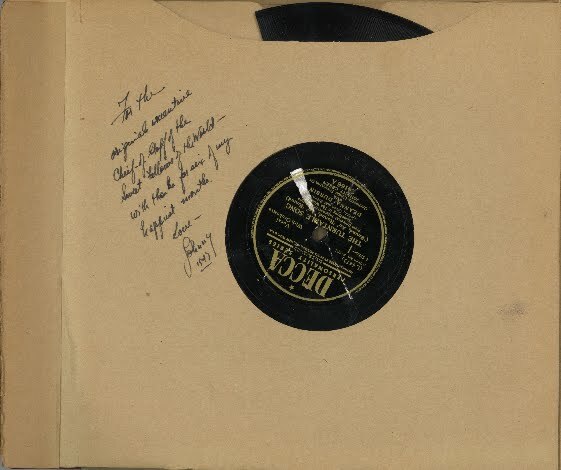 In the next photo, you can see a specially-inscribed message Johnny wrote for Leo on the inside sleeve. 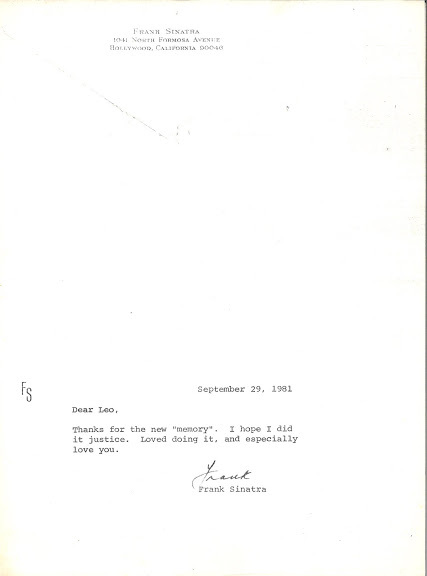 Affectionate thank you letter from Frank Sinatra. 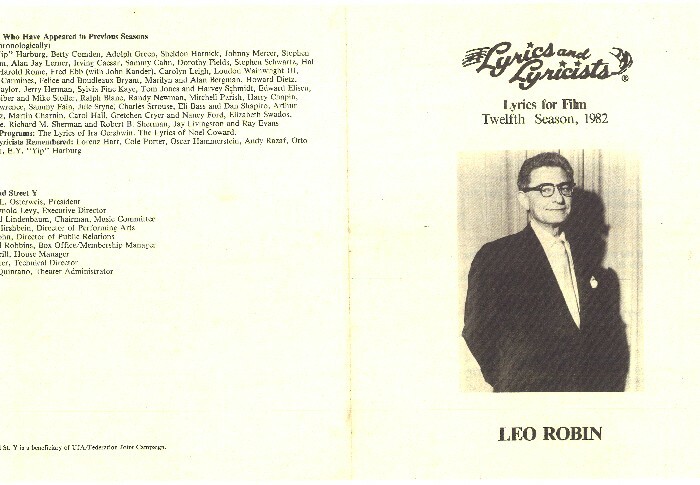 In 1981, Leo, at Frank’s request, ‘updated’ “Thanks For the Memory” specifically for him to sing on his TV special, Bang Bang Baby She Shot Me Down. 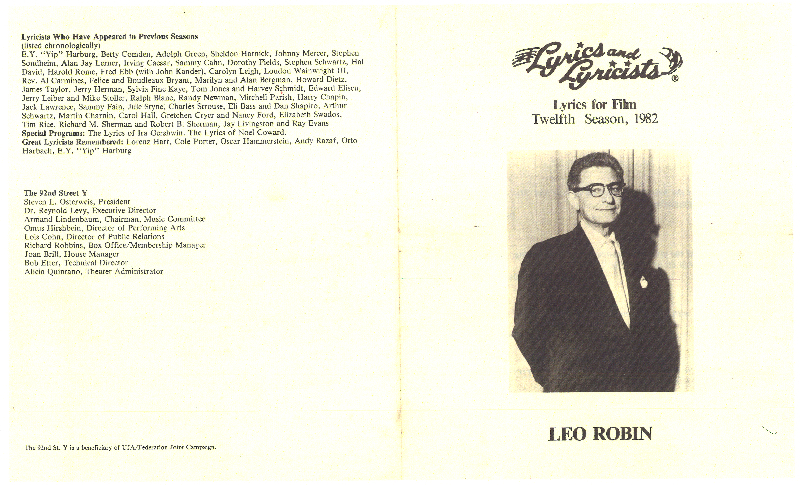 "The Lyrics and Lyricists: Lyrics For Film" Program presented by The 92nd Street Y to honor Leo Robin in 1982. 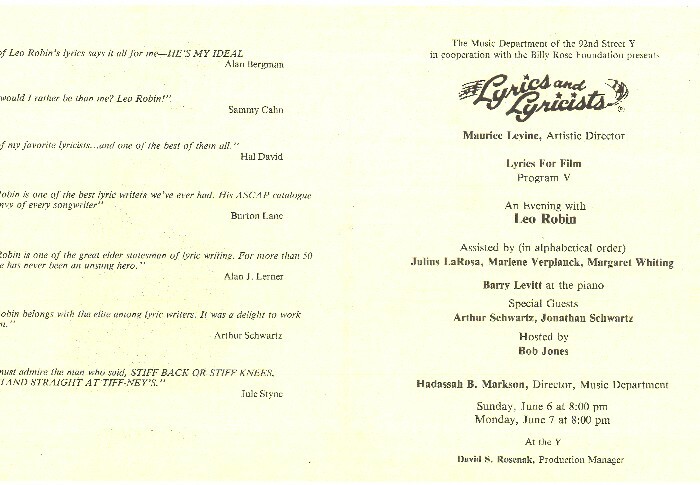 "The Lyrics and Lyricists: Lyrics For Film" Program presented an evening at The 92nd Street Y in 1982 to honor Leo Robin’s unforgettable contribution to musical film. 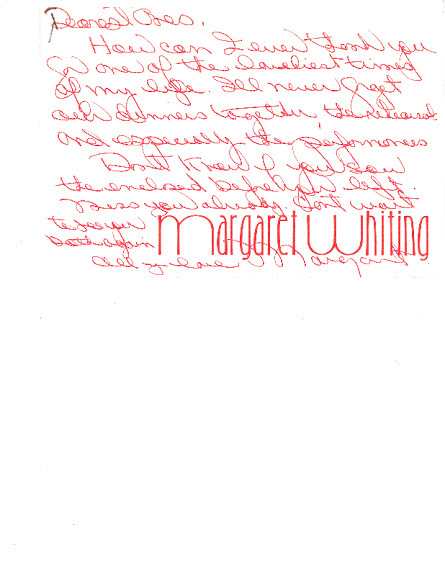 Endearing note to Leo Robin from Richard Whiting’s daughter, Margaret, after the evening at the Y. Leo Robin and Richard Whiting wrote many standards including "My Ideal" which became Margaret's theme song. 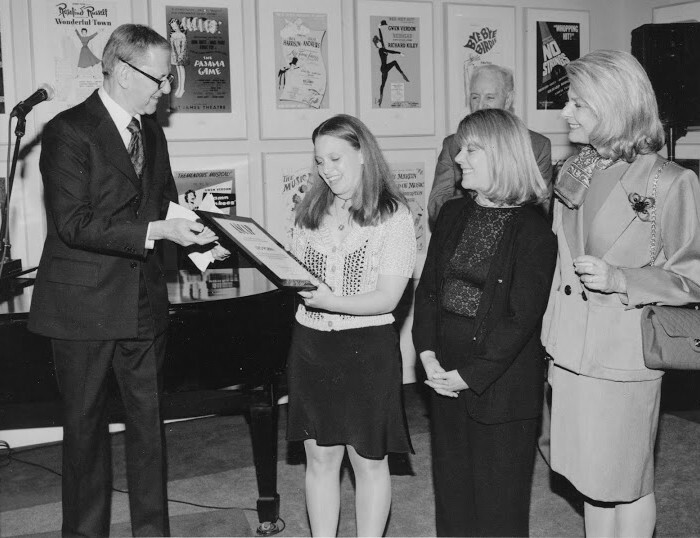 On a personal note card she wrote, "Dearest Leo, How can I ever thank you for one of the loveliest times of my life? 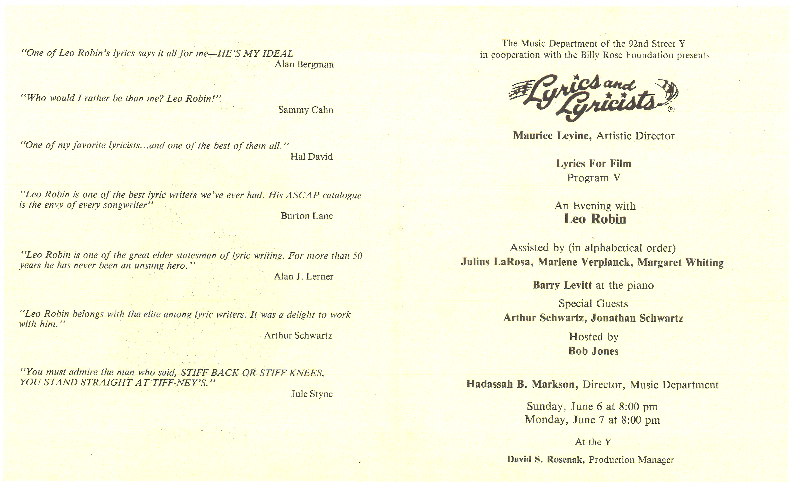 I’ll never forget our dinners together, the rehearsals and especially the performances. Don’t know if you saw the enclosed before you left--Miss you already. Can’t wait to see you both again. All my love, Margaret." 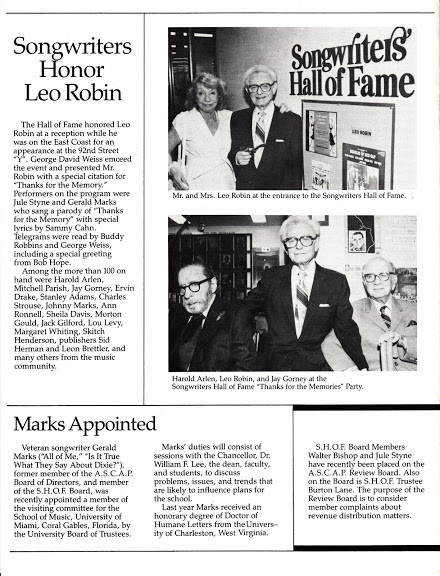 Songwriters honor Leo Robin at a special event sponsored by the Songwriters Hall Of Fame. 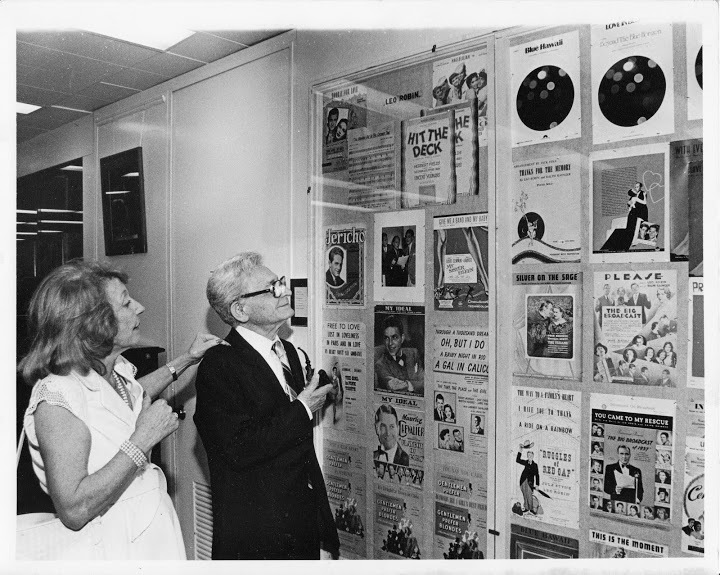 Mr. and Mrs. Leo Robin at the Songwriters Hall of Fame. 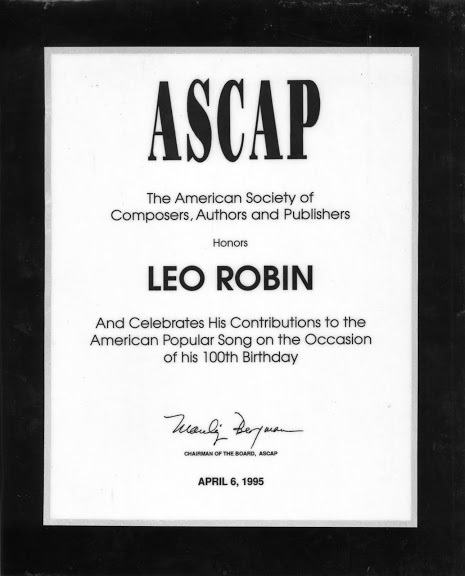 The American Society of Composers, Authors and Publishers (ASCAP) celebrate in 1995 the commemoration of Leo Robin's 100th birthday. 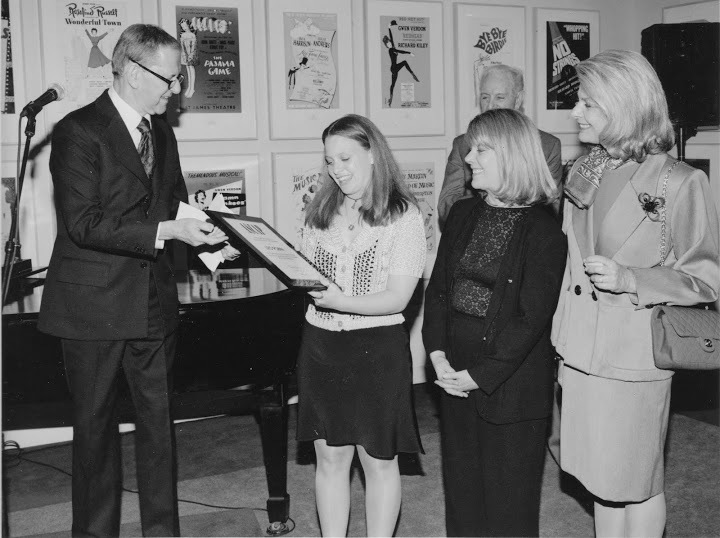 The famed actor Tony Randall presented the award. 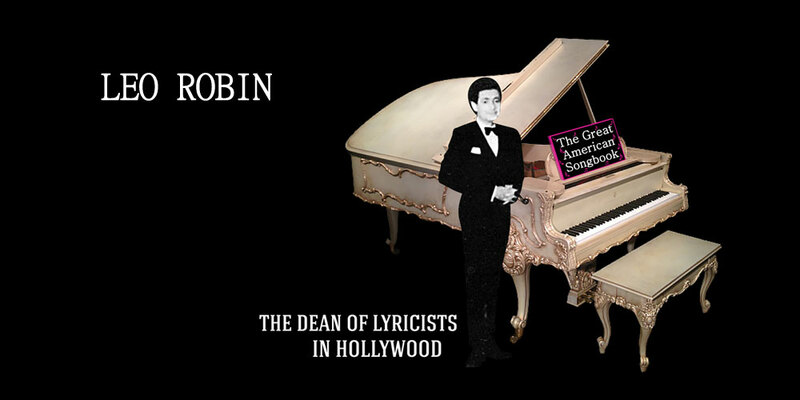 Special award from the American Society of Composers, Authors and Publishers (ASCAP) honoring Leo Robin's legacy on the occasion of his 100th Birthday in 1995 for his "Contributions to the American Popular Song." 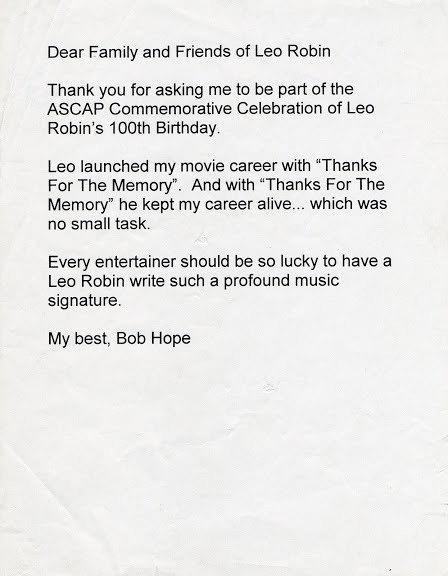 Typewritten tribute from Bob Hope on the occasion of Leo Robin's 100th Birthday. 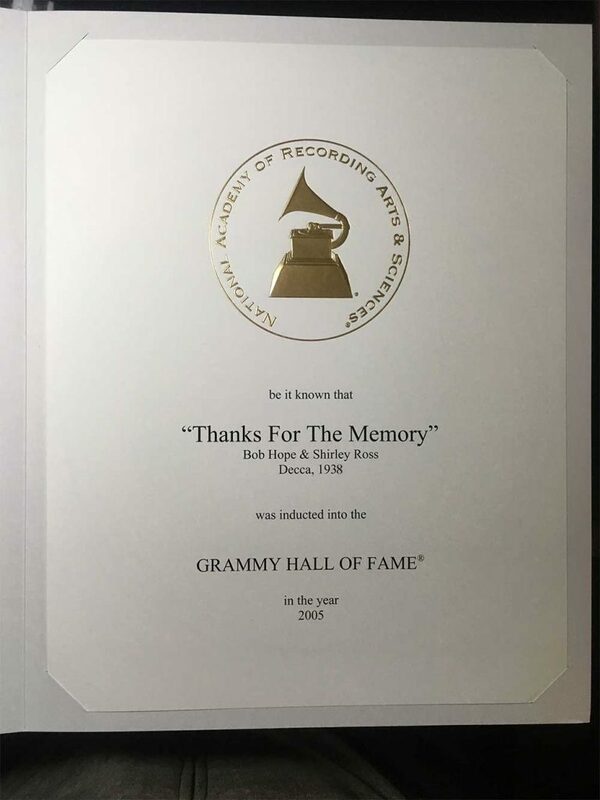 Grammy Hall of Fame. 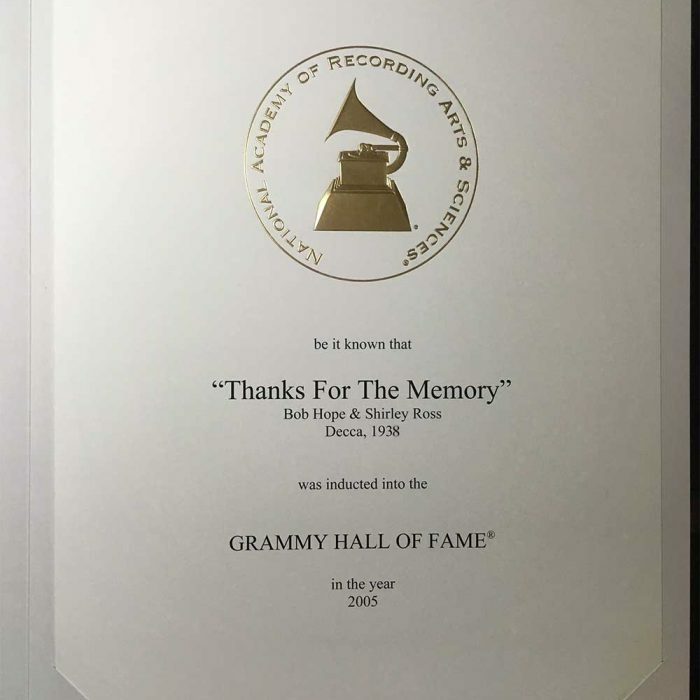 National Academy of Recording Arts & Sciences made it known that Bob Hope and Shirley Ross' recording of "Thanks for the Memory" (Decca, 1938) was inducted into the Grammy Hall of Fame in 2005. 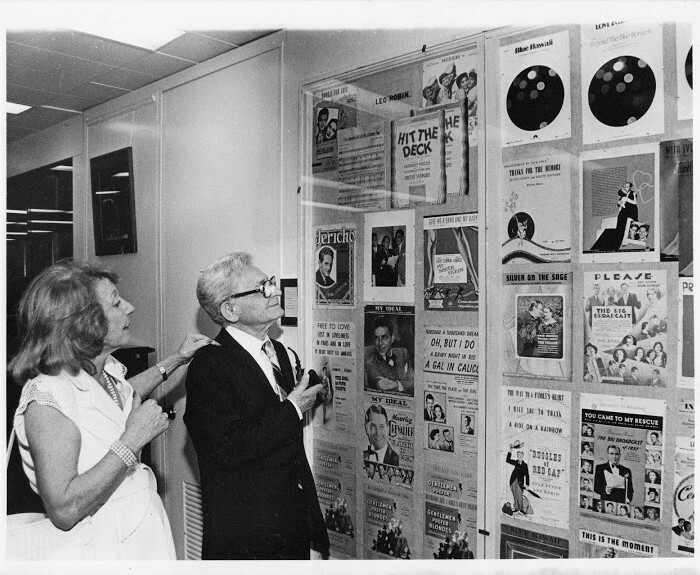 The Hall was founded in 1973.